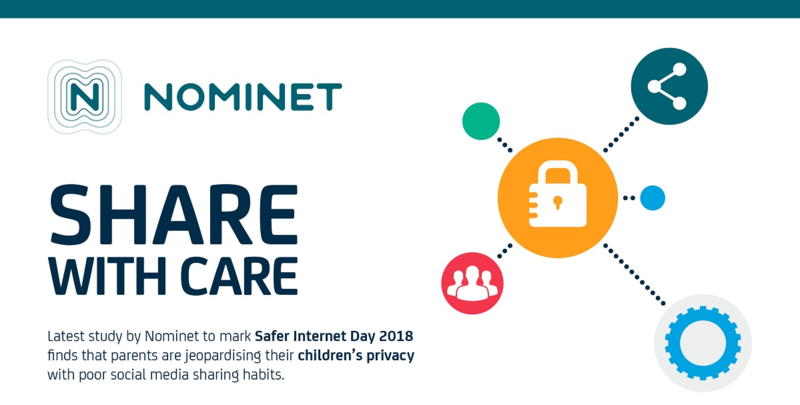 6th February 2018 – Oxford, UK: British parents are risking the privacy of their own children and families by openly sharing photos and videos with complete strangers on social media, according to new research released by Nominet to mark Safer Internet Day. The latest Share with Care research found that over a fifth (22%) of parents of children up to 13 years’ old – the equivalent of over 2.7 million people – either have completely public Facebook profiles or profiles that can be viewed by ‘friends of friends’, meaning that they’re sharing their posts with total strangers. However, even those who only share posts with friends could unwittingly be sharing personal content with people they don’t know. On average, parents of children aged up to 13 have 207 Facebook friends, however 61% of parents admit that fewer than half are ‘true friends’ that they would say hello to in the street or socialise with regularly. The findings come despite parents admitting to concerns around the repercussions of sharing images of their children online. Almost half (47%) are worried that somebody could steal these images and use them without permission, 42% are concerned that people they don’t know could see the photos, a quarter (24%) think their child would be unhappy about so many images being shared and 12% think they could undermine their child’s future application to a university or employer. On average, parents of children aged up to 13 share 71 photos and 29 videos of their child every year to social media sites. This is a significant reduction since 2016, when Nominet’s previous Share with Care study found that parents were posting an average of 299 photos of their children on social networks every year. This may be a result of parents becoming more aware of ‘oversharing’, or a shift to sharing via private group messaging apps like WhatsApp. But despite sharing fewer images of their children than before, parents still struggle to manage who can see them. Many parents still don’t have a good understanding of social media privacy settings, with fewer than half (43%) saying they are very confident at managing them. Meanwhile more than a tenth (13%) have either never reviewed their privacy settings, or have no idea how to do so. A further fifth (20%) haven’t checked them for over a year. More than half (51%) of parents never ask, or don’t feel the need to ask, their children if they mind their image being posted online, although almost a fifth (18%) say that they always check that their child is happy before they upload. As well as photos of their own child, more than 6 in 10 parents (61%) are also posting pictures of other children online. In the last year, these parents have shared an average of 3.5 photos featuring other people’s children. Almost half of parents (47%) would always expect other parents to ask their permission before posting a picture of their child, with a further 31% expecting to be asked for permission depending on the context. However, a quarter (25%) admit to never asking for permission before uploading a picture of someone else. When it comes to their own children’s use of social media, a quarter of parents (25%) allow their children under the age of 13 to have a Facebook account, 16% allow them to have an Instagram account and 13% allow them to be on Snapchat. All three services have a minimum age limit of 13. More than a quarter (26%) of parents who let their pre-teen children use social media insist on knowing their log-in details, while 25% supervise how they use it. However, 22% worry that they spend too much time using it, and the same percentage (22%) worry about the impact it could have on their mental well-being. Only 13% of parents believe that social media is ‘harmless fun’. Opinion is also divided when it comes to social media companies launching services specifically for children, such as Facebook Kids, though more parents are against rather than for them. While a quarter (26%) think they’re a good thing that helps children to communicate in a safer environment, a third (32%) think that they’re a bad thing, and that children don’t need to use social media at such a young age. More than a fifth (21%) think social media companies should be prevented from targeting children entirely. Do you Share with Care? Take our short quiz to see how you’re doing. For a visual snapshot of the research see our infographic. For more information please contact Victoria Marnoch at Brands2Life on [email protected]. Nominet commissioned Opinium to survey a representative sample of 2,001 UK parents of children aged 0-13, between 17th and 22nd January 2018. Parents were asked about their youngest child. Opinium’s omnibus research found that there are 12,276,248 parents of children aged 0-13 in the UK. Headline statistic: 22% of parents allow strangers to see their posts. According to Opinium’s omnibus, 24% of the population are parents of 0-13 year olds, and according to ONS, there are 51.7 million adults in the UK. Therefore 12.408 million people are parents of 0-13 year olds. 22% of 12.408 million = 2,729,760.